Physical characteristics: Willie wagtails are larger than the average fantail, with a length of 7.1 to 8.7 inches (18 to 22 centimeters), and an average weight of 0.6 to 0.8 ounces (17 to 24 grams). They have black plumage and a white brow and breast. Geographic range: Depending on the particular population of willie wagtail, they can be found throughout Moluccas, New Guinea and the surrounding islands. One population can be found on the Bismarck Archipelago, Solomon Islands, and northern Australia. The other population can be found in southwest, southern, central, and southeast Australia. Habitat: Willie wagtails prefer open areas and can live in a variety of diverse environments such as the desert, open grasslands, and in city parks, but they are not found in dense rainforest or eucalyptus forest. Diet: Willie wagtails are carnivores, meat eaters, eating primarily insects and small lizards. They get their food by hawking, diving and grasping their prey, from perches. They grab insects out of the air or grab them from the ground after a short run. Behavior and reproduction: This bird is primarily terrestrial, and runs, walks, or hops along the ground foraging for its prey. While in motion, their tails are usually lifted but not fanned out. When they pause, their tails swing back and forth, and up and down. Willie wagtails always have a mate nearby, but are usually alone when observed. They are noisy, active birds, often confronting or attacking larger animals that are known predators, or that enter their territory during breeding. They show aggression by puffing out their white eyebrows. In Australia the birds are considered primarily sedentary. However, in New Guinea they are known to leave certain areas during the dry season and return during the rainy season in order to breed. When willie wagtails are upset, they can be heard as giving a harsh scolding sound. 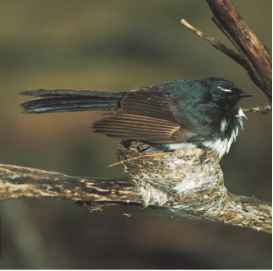 Willie wagtails breed mostly from July through February in Australia, but can nest in any month depending on suitable conditions. They can have up to four or more broods in any season. Both parents build the nest, incubate, and care for the young. Their nests are made of grass and fine bark, then covered with a spider web. However, the nests do not have the characteristic "tail" dangling underneath. The nest is placed on a horizontal fork or in a human-made structure or other suitable site, no higher than 16.5 feet (5 meters) above the ground. The eggs are cream colored with brown and gray speckles that form a wreath at the larger end. The incubation period lasts fourteen to fifteen days, with fledging after fourteen days. Willie wagtails and people: Willie wagtails are popular in Australia. In parts of New Guinea legend says that they are the ghost of a paternal relative and thought to bring good luck. They are also considered to be a gossip so people avoid telling secrets when the birds are around. Coates, Brian J. 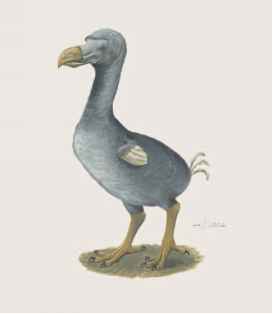 "The Birds of Papua New Guinea." In Passerines. Vol. 2. Alderley, Australia: Dove Publications, 1993. Hvass, Hans. Birds of the World, in Color. New York: E. P. Dutton & Company, Inc., 1964. "Fantails and Allies." Personal Museum of Natural History. http://www. planktonik.com/museum/en/birds (accessed on June 17, 2004). "Fantails of the World." World Bird Gallery. http://www.camacdonald. com/birding/Sampler6_Crows%28Fantails%29.htm (accessed on June 17, 2004). "Fantails: Rhipiduridae." Bird Families of the World. http://www. montereybay.com/creagrus/fantails.html (accessed on June 17, 2004).